An aid distribution centre in Ukraine, which witnessed a dramatic rise of people in need of humanitarian assistance in 2016, due to the ongoing conflict. According to the United Nations Office for the Coordination of Humanitarian Affairs (OCHA), an estimated 3.8 million people in Ukraine are in need of humanitarian assistance and 2.2 million are suffering as a result of no access to quality health services. Compared to 0.7 million people needing humanitarian assistance earlier this year, the dramatic rise is due to the ongoing conflict, which has brought about restricted movement for both people and goods, suspension of social payments and pensions, and unsafe returns to non-government controlled areas. Meanwhile, ongoing hostilities have wrought extensive damage to infrastructure, leaving 3.7 million people in need of water and sanitation support. Shelling occurring close to electricity and water installations has led to continuous interruptions in both water supply and heating systems. Due to freezing temperatures and a lack of clean water, some schools have been forced to close for days at a time. In additional to interruptions due to structural damage, there have been issues of non-payment, leaving some four million people under threat. However, this month, several local authorities announced a plan to provide financial assistance to Voda Donbasa, a water supply company, in order to cover consumers’ unpaid bills and avoid supply cuts during winter. In order to respond to the crisis, OCHA and its partners are requesting $214 million from donors, which will cover the needs of the most vulnerable 2.6 million people. The 2017 Humanitarian Response Plan (HRP) includes 94 projects and 215 partners, many of which are national non-governmental organizations (NGOs). OCHA’s latest bulletin reports that as of 30 November, 9,598 people were killed, 22,311 wounded, and 1.1 million fled the country. While the number of casualties has dropped slightly as winter sets in, the situation remains tense. 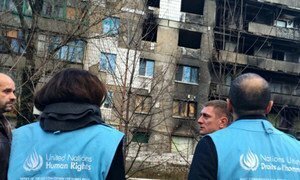 OCHA reports that damage to housing and civilian infrastructure occurs on an almost daily basis, with the majority of incidents occurring in Mariupol, northwest of Donetsk, and Luhanska oblast, areas along the southern border. Security checkpoints remain a threat to civilians, as both casualties and injuries have been reported over the past few months. With fewer hours of daylight and winter conditions, fewer people have been able to cross. While efforts have been made, checkpoints still lack adequate health, sanitation, and shelter facilities, putting those who are exposed to wind, snow, and freezing temperatures at greater risk as they wait in lines. So far, the HRP has reached 33 per cent of its funding goal, compared to a 61 per cent funded plan in 2015. OCHA and other UN agencies are working to deliver humanitarian assistance alongside the Government of Russia.